Get fit, get healthy, get motivated. My new mantra for this year. Let’s just say it hasn’t been going as planned but I am getting there. With this in mind, fellow friend, Aasia, and I are taking up the well i am Challenge – 100 days to get Summer ready – a 100 days of healthy. The reason I’m doing this amongst other things, is that I have a bad habit of not sticking with one thing long enough. Also, I need the support structure that challenges like this provide. If someone is encouraging to do it, I am more motivated to actually complete it. Ask me to do it on my own and … well… I love food and being lazy. It’s also all about the planning, and this is where I really fail. This is the third addition of the well i am challenge. 100 days to transform my body and my habits. The great thing about this challenge – its all based online (well, almost all of it). If I spend most of my time online, I may as well make it work to my benefit. well i am’s revolutionary approach to online wellness means formal before-and-after assessments (in comparison to the usual do-it-yourself style), and it does not conflict with any existing fitness challenges – online or other. well i am supports whatever fitness journey you are on with a unique and motivational online support system to get you closer to your goals. We believe in incentives, and your registration options include a Bosch Appliance, Biogen products to the value of R250, 50% off all Reebok apparel online, and your custom-made, bespoke Health Box packed with extras and valued at over R300. Certified dieticians and fitness experts have also supplied you with comprehensive eating plans and training programmes, absolutely free. Like our previous challenges, you’ll have a detailed Dis-Chem Health screening at the start and end of your journey. They have an exclusive member’s only platform to help with that motivation and planning. 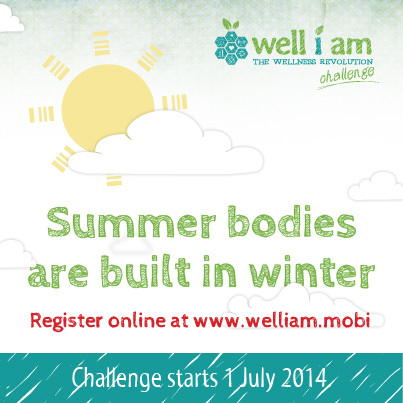 Challenge starts 1 July – so get registered and join me!